Just recently, I had a day where nothing was going right (like most days...haha) and I was in a rush. I was all scrambled, I couldn't think, I was forgetting important things, I didn't look the greatest clothing or hair wise, and I was running late to head out the door. I immediately thought, Jess, if you had just prepared before and did things to save yourself some time, everything would go so smoothly. Right after I had this little thought, I figured that I should make a blog post for people who are in the same boat as me most of the time. In my opinion, it can be very hard to manage your time and manage it well. Particularly in the morning if you're like me, a zombie, right when you wake up. 1. Pick out your clothes the night before. This will save you loads of time the next morning when you get ready. Also, make sure you check the weather for the next day so you will know what to pick out to wear that night in preparation for the next day. Another thing I would suggest that really, really saves time and goes right along with picking out your clothes, is picking out your shoes, jewelry, and any accessories the night before as well. What I do, is leave the shirt that I'm going to wear on the hanger and slip the pants that I'm going to wear through the shirt hanger. I drape any necklaces, rings, scarves, etc around the shirt on the hanger as well. I set my shoes out right beside my pre-planned outfit. I usually like to hang all of this on my dresser since it is right there when I wake up in the morning. It's just a hop, skip, and a jump away. 2. Pick out your makeup, hair tools, grooming tools, etc...the night before. Just like picking out your clothes the night before helps you to save loads of time and be better prepared in the morning, picking out your makeup, hair stuff, and etc is also a huge time saver. Even if you wear the same makeup and do the same hairstyle every day, it's handy and quick to have it all set out ready for you to grab and slap on. 3. Get the house straightened up and looking clean the night before. I know that this step sounds a little ridiculous, but it really does help. In the morning, you are half awake and half asleep most of the time. You are slightly aware of what is around you, but in the wee morning hours, you just don't care. So, in that case, it's important that you don't have junk lying around and things all over the floor that you could trip on and fall over and just really start yourself off to a bad day. Also, when everything is clean and fresh looking, you instantly feel happier. It's kinda a proven fact. If your house/room is cluttered all around you, chances are, your mind will feel and become cluttered as well. When you are in the early hours of the morning getting ready for the day ahead of you, you want to feel relaxed like you don't have to rush, calm, clear minded, and happy. You will also be able to find things when you need them instead of rummaging through piles of junk on your counters or floors. You want to start the day clean and wonderful feeling. Also, you won't have to clean as much through the day since you took that prep work the night before.While this step requires a little bit of harder work than the first two steps, it really pays off. 4. Pack your bag/purse/lunch the night before. This step also really helps to save time. A lot of times, when you are rushing around in the morning, you forget the things that you need to bring with you and take for the next day. If you pack your purse beforehand with the things that you need for the following day, you can really relieve some stress and worry. The next day, it is very often that important things can be forgotten since you didn't have enough time to pack it in your purse/bag. Another good thing to do, especially if you go to school, college, or work, is to pack a lunch the night before unless you'd rather buy it that day. This also saves you from making bad choices the next day when you are starving! You think, "Oh...that whole box of pizza looks so good. I think I could even eat this whole thing by myself..." When we start to do that, we get in trouble. Later, we'll be so full that we will be paying for it. Now, I know that's kind of a dramatic example, but we all do crazy things when we're hungry. lol I'm definitely not about to sit here and tell you that I eat healthy and prepare my lunch before hand and have regular servings of pizza...hahaha....because I don't. I'm just giving you some examples and ways to save time that I have found that actually work. 5. Know what you are going to eat for breakfast for the next day. A lot of times, I waste 10 to 15 minutes trying to look for something to eat when I could have been done eating in 5 to 10 minutes already. I usually like breakfast to be my very lightest meal. I've heard that it is supposed to be your biggest, but I'm not like other people. :) If I knew what I was going to eat the night before, knew exactly where it was, I could just grab it and go. Or, let's say for example, that I wanted oatmeal for breakfast. I'd look through my cabinets and made sure that I had all of the things for oatmeal that I need. It's a little thing to think of what you'd like to eat in the morning, but it can really help as well. 6. Take a shower the night before, or take a quick 5 minute shower immediately after you get up. A lot of times, showering the night before can save lots of time during the day because after you take your shower, you have to dry your hair and do other things. I always used to shower the night before because it saves 20 or more minutes most of the time. As I've gotten older, I've found that I prefer to be good and clean before I start my day. I always feel more productive and I get more things done. I really do. It sounds strange, but it's kind of proven. :) I also feel like when I take a quick shower in the morning, then I feel cleaner a lot longer throughout the day. Another thing you could do to save time that relates to the whole shower thing is to only wash your hair the night before and wash your body in the morning or vice versa. 7. Make your bed. Ah, yes. The dreaded thing that almost everyone hates to hear. At least, I do. You're probably wondering why making your bed can actually save you time in the morning. Wouldn't it subtract time from your schedule? Oh, contrare, my friend. While it may feel like that you are making your bed for 10 minutes, in reality, you have only taken 2 (3 minutes at most) minutes. That little act that you did just then that felt like it took you forever, will be so nice once you get home and slip into a clean, made bed. Even if your sheets are dirty and it is the last day for you to have them on there before they're changed again, they will still feel clean since you took 2 minutes in the morning to make your bed. I would suggest doing this right after you get up. As in, right after you roll your zombie like body out of bed and onto the floor. Immediately turn around and slowly start making your bed in a trance like fashion. hahaha It will be done before you know it and that little extra effort on your part really pays off. 8. Make a to-do list or a schedule the night before. Making lists is honestly and weirdly one of my favorite things to do. It just makes you feel so much more productive when you have a list in front of you that you can check off. Also, lists really help you to remember things you might have forgotten if they weren't written down in front of you. I would suggest to look over your to-do or schedule in the morning while you are eating breakfast. 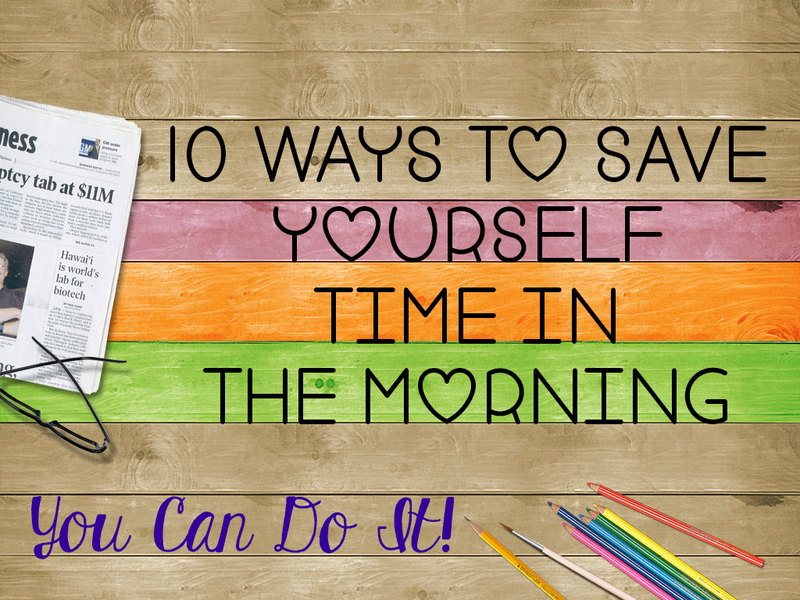 Give yourself at least 10-15 minutes to eat, drink your coffee, get your head together, and wake up before getting ready for the long day in front of you. It really helps. 9. Charge anything electronic that needs to be charged the night before. I'm sure that I'm not the only person in the world that has been out with their cell phone and then it suddenly just turns black. Yep. My cell phone needed to be charged. Maybe you've been listening to your MP3 player and then the music shuts off and your screen turns black right in the middle of one of your favorite jams while you're out and about. You really wished that you had charged everything the night before so that you wouldn't have to worry about any of this. The simple act of plugging all of your electronics in before you go to sleep, will help you out. What if you have an emergency and your cell phone just dies? If you charge it the night before, you should be all set for the following day. 10. Last, but certainly not least, make sure you let everyone know how much you love them. Be kind to your loved ones. Do nice things for them. Take a little time out to write them a sweet note. Pray to God and thank Him for all of the beautiful people and blessings in your life because they could be gone the next day quicker than the blink of an eye. God has blessed me in so, so many ways that sometimes I take things for granted and aren't as appreciative as I should be. If God wanted to, he could take away all of these blessings and wonderful people from my life the next day. It's important to take time out of your busy days to be compassionate. In a world full of evil and selfishness, it's important that you treat people differently than the world treats them. No one wants to be forgotten, treated badly, etc. Make sure you show them Christ through you. Jesus is the kindest person that ever lived on this earth. I think he would want his people to treat everyone the way he would. You never know what is going to happen tomorrow. Tell people you love them while you can.